Career Conclave 2019: Delhi’s Deputy Chief Minister Manish Sisodia today said the focus of the AAP government is not only on building classrooms but also solving various matters faced by the students through discussions. 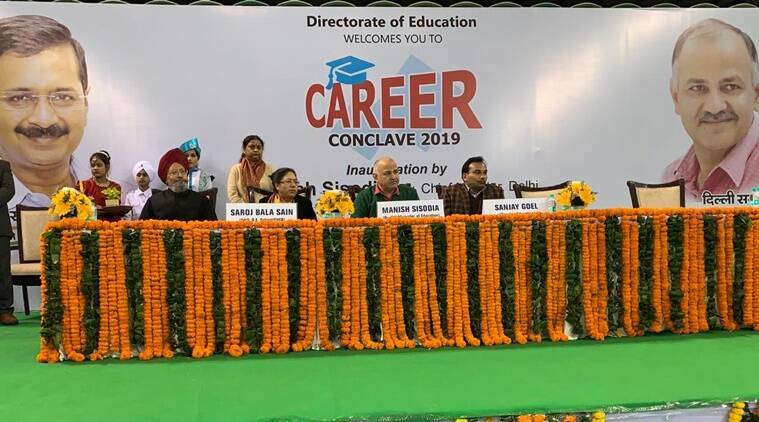 Addressing the Career Conclave 2019, Deputy CM Manish Sisodia on Tuesday said that the government organised the conclave to inform students about various career opportunities. Sisodia, who also holds the education portfolio, told students that years back, there were only three options — doctor, engineer or director, but now there are various opportunities. “Choosing a right career is very important to get an achievement. The students should choose their career of their choice,” said Sisodia. Interacting with students, Deputy CM Manish Sisodia suggested students keep their aspirations high. “Those persons who keep their aspirations and dream high get success in their life. You can fail in fulfilling your dream, but you will get the result once,” said Sisodia. On Sunday, Delhi CM Arvind Kejriwal flagged off the construction work of 11,000 new classrooms. “The Aam Aadmi Party (AAP) government in New Delhi is not only building classrooms but holding ‘charcha’ (discussions) with students,” said Sisodia.